At the moment, CUA Mobile Banking is not available for download on computer. However, you can use emulators to run Android applications on PC. One example is the BlueStacks App Player. It is a powerful tool that provides users a virtual device similar to an actual phone. This also enables users to install games and other popular and in-demand applications. 3: Search for CUA Mobile Banking on the Play Store and install it. CUA’s mobile banking app lets you do your banking anywhere, anytime – so you can spend more of your day enjoying the things you love. What can you do with CUA Mobile Banking? Payments - Transfer between your own accounts, pay someone or pay a bill - Schedule a one off or recurring payment (daily, weekly, fortnightly and more) - Set up new payees or BPAY billers and view and search existing ones Accounts - View all your CUA accounts details and balances in one place - View, search and filter any upcoming payments and your last six months of transactions Other features - Log in using Fingerprint / Face ID on supported devices - Find your nearest branch - Change your Web Access Code (WAC) after you log in - Contact CUA via phone or email - View Personal Account Details - Access the iM CUA app to chat to a CUA Personal Banker Accessing CUA Mobile Banking To get started with the CUA Mobile Banking app, you’ll first need to be able to access CUA Online Banking. 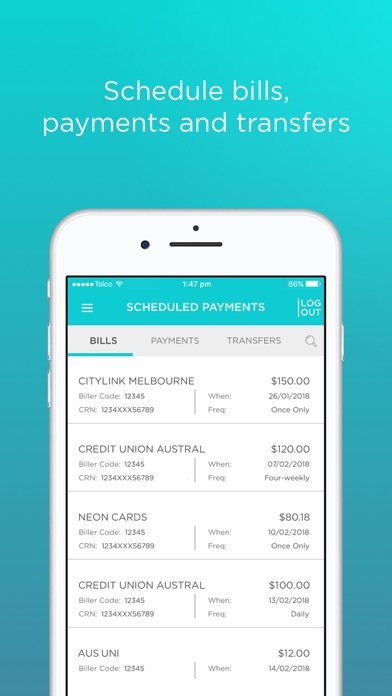 If you don’t already have access, please call us on 133 282 or drop into your local branch. 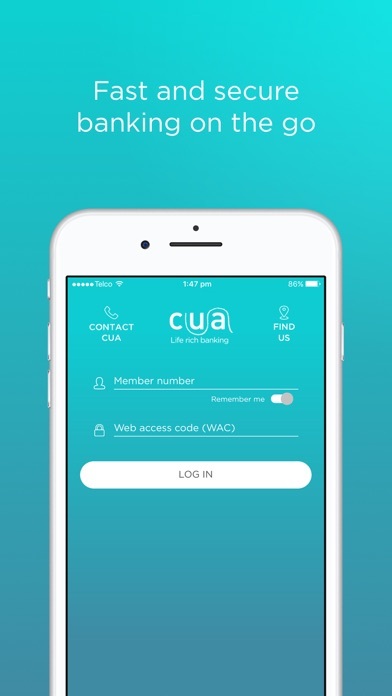 If you’re already registered for CUA Online Banking, simply download the CUA Mobile Banking app and you’re ready to go. The first time you log in you’ll need your existing member number and Web Access Code (WAC). You’ll then be able to save your member number securely on your mobile device so that the next time you log in you’ll only need to enter your minimum eight-alphanumeric WAC or use your fingerprint/face on supported devices. Please note; BETA operating system software is not supported by CUA, please refer to our General Information, Terms and Conditions. While the Mobile Banking app can be downloaded on iPads, it’s not actually compatible with these devices. Therefore, we only recommend using the app on your iPhone. This will ensure you get the best possible experience and the most from the features the app has to offer. Security CUA Mobile Banking provides the same high level of protection as our online banking service. To stay secure, we recommend that you: - Keep your WAC and member number secret - Always log out once you’ve finished your banking Remember CUA will never send you emails, SMS messages, or call you to ask for personal information such as your member number or WAC If you receive any suspicious communications, do not respond or click on any hyperlink or attachment included in the message, as it could be an attempt to obtain your personal information or fraudulently access your account. If you’re in in doubt, please call CUA immediately on 133 282. If you have accidentally revealed any personal banking information, please change your WAC immediately and contact us on 133 282. More advice for protecting yourself and your information can be found at www.cua.com.au/tools-and-services/support/security-and-fraud Important information Your use of the app, and any specific products or services that you may access using the app, is subject to CUA’s General Terms & Conditions. 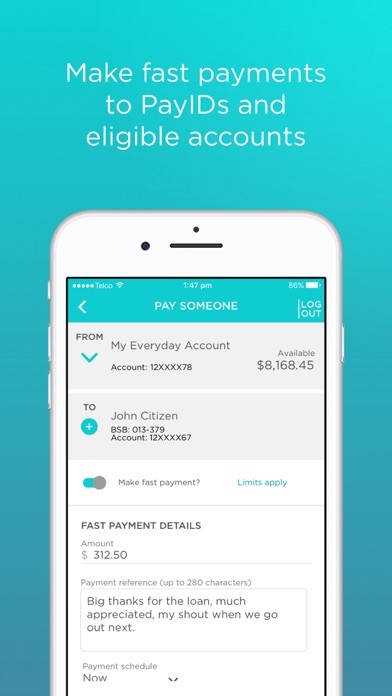 Please read both the General Terms & Conditions and the security tips – available at www.cua.com.au/tools-and-services/support/security-and-fraud - before downloading this app. Any reference to internet banking in the General Terms & Conditions also applies to the use of this mobile banking service. By clicking download and install, you agree to the General Terms & Conditions. There’s no fee for accessing your CUA accounts using your mobile. An internet connection is required and you may incur data charges from your mobile provider. Access is subject to availability and maintenance. It’s ok but has room for improvement. The CUA mobile app is basically good. It works, but it’s basic. Areas to improve: Extra security is needed. If I purchase something over $100 and use Apple pay I should have to type in my PIN number. Be able to change my PIN number on the phone app. I don’t use my card to withdraw money much these days, so can easily forget my number. With extra security built into the app, I should be able to change my number. Build an Apple watch app for CUA banking. Allow NPP over the phone app. Allow customers to organise their online or app account so they can closely monitor their spending. So we know if we’re spending too much on eating out or clothes or bills, etc. 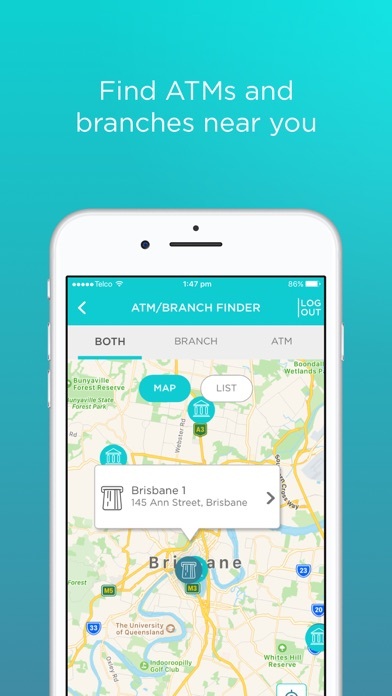 Improve the find an ATM near me part of the app by including not only the address, but also the name of it, eg. a Westpac ATM. Addresses aren’t as easy to see as a Bank name when you’re in the street. Allow mobile app users to state where & when we are going overseas for card safety (like NAB). The latest update is brilliant. It has a modern feel that’s simple and intuitive. Everything just seems to work. And that’s a remarkable feat - seeing as this is a major updates that’s only just been released. 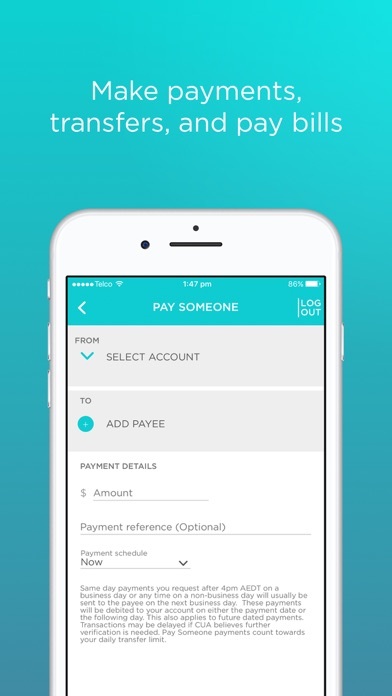 Well done to CUA, and to Pivotus Ventures. Let’s hope you both continue adding features and updates! Continued investment in mobile will only draw more and more attention to the younger generation. Please don’t leave your mobile technologies stale, or forgotten! 2 stars because this app out of all apps is at the top of worst performing when new versions are released. It makes the app unreliable when a new version stops the old version working or removes login details and finger print login after update. 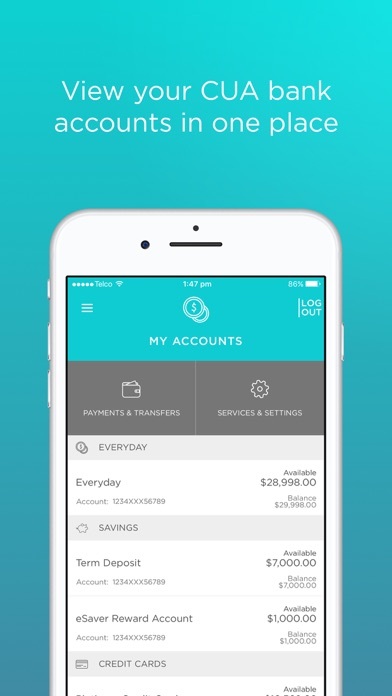 Customers expect to log in and access our bank balance 24/7. If it continues I may have to change banks, I’ve been patient for 2 years! I love CUA, I even love the second last upgrade of the app with lots of new features, but when the app only works for a week or two then glitches is so frustrating!